So not a whole lot of knitting has been happening lately. Work is busy and I'm taking an accounting class and most of ny free time has gone to my kids or my husband. I haven't even been out with friends in ages. 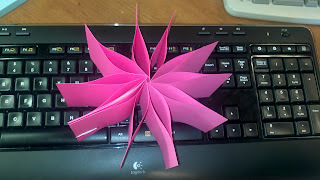 So here's a bit of office art - post-its and a paper clip!